The recent Sangita Kalanidi Awardee, this carnatic musician is beyond amazing. Her flow in carnatic music can be compared to a river! Such is the placement of her notes – easy flowing and along the course of the rules of the carnatic music. She was bestowed with Padma Shri in 2004 itself. SudhaRaghunathan has done various stints in the field of carnatic music. She has over a 2000 cd’s/cassettes that have been released under various labels. Sudha’s talent in music was what won her a scholarship to get tutelage under the ace musician Dr.M.L..Vasanthakumari. One pride associated with Sudha that all of us are well aware of is her way of singing the beautiful song ‘Vande Mataram’.Infact she was called to sing the song at the Parliament on its 50 years of completion. This Kalaimamani Awardee is also brilliant with her academics. A Master in Economics, she graduated from our very own Ethiraj College in Chennai. Sudha is also one of the most wonderful person who loves to delve into social service and this has made her the Managing Trustee of the ‘Samudhaaya Foundation’. A versatile singer by nature she has also stepped into the ocean of playback music industry. Her ‘Annul Malae’ was a huge hit amongst the tamil audience from the movie ‘Vaaranam Aayiram’. Another beautiful song to her credit is the theme song from the movie ‘Thavamaai Thavamirundhu’. Sudha Raghunathan has also sung the song ‘Kadhal Periyatha kamam’ from the movie ‘Sattham Podathey’. Although just a handful of songs in the playback industry, she has made a mark here too. 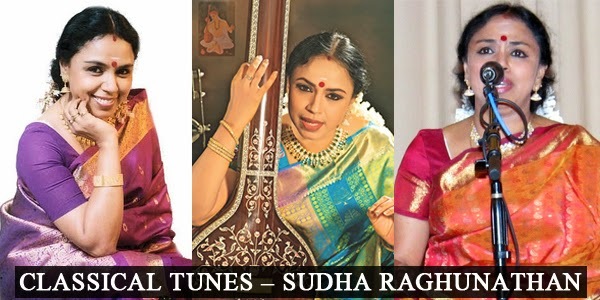 Sudha is also vouched for coming up with innovative concepts in presenting her carnatic rendtitions and also for her partnerships with other stalwarts in exploring the the various nuances of carnatic music as a whole and thus keeping the rich tradition alive.